This week I attended a screening of Concussion, a new Will Smith movie about the impact of repeated head trauma in the National Football League (NFL). Friends at Values Partnerships had informed me of Concussion and invited me to the screening in Washington, D.C. I had viewed the trailer and read more about the film before attending. My initial response to my assistant was, "Wow, this movie seems to be attacking the NFL. No one in their right mind would tackle football, a very highly regarded sport in America! I do not wish to touch this." 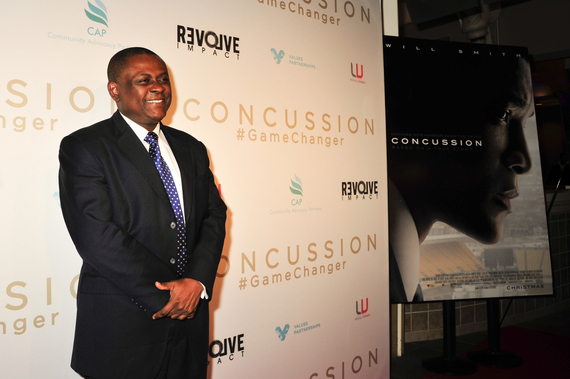 The movie tells the story of Dr. Bennett Omalu, a Nigerian doctor and brilliant forensic neuropathologist who discovers the true harm of concussions, chronic traumatic encephalopathy (CTE), and fights to share his research with the world. The film was powerful, visceral, but also in a way, deeply spiritual. The courage displayed by Dr. Omalu stemmed from his strong faith and moral conviction. A big theme of the film is how Dr. Omalu thinks he's the "wrong person" to have discovered this problem - implying that, through faith, unlikely people can change the world. He maintained his determination and faith to make people aware of this issue even in the face of considerable resistance. This clip shows a bit of the challenges he faced, and the strength it took to overcome the opposition he faced. As Concussion moved on in its story, it became more amplified for me to question if the NFL should be solely responsible for concussions in their players. I have to say though, after attending the screening at the Regal Theater in Washington, D.C. and meeting Dr. Omalu, I came away with a completely different understanding of the issue. I might be one of the few yogi sisters who can actually sit through a football game and share about the plays, penalties, and more! My initial reaction was to prematurely interpret some of the rhetoric I read and saw in the trailer as an attack on the NFL. However, it's not my nature to make a judgment after hearing only one side of any story. Come on, I'm a yogi sister! The movie illustrates the danger of some sports, especially football. However, the NFL didn't create concussions - concussions are casualties of certain sports. The NFL is a for-profit business. As Dr. Omalu explained after the screening, "The brain does not wear a seat belt" and is not designed to withstand continued trauma. Multiple hits to the head and head butting can cause irreparable damage. Athletes are aware of possible head/brain trauma and make a conscious choice to play the game. Perhaps what I see here for the NFL as a best practice would be to utilize some of its profits towards those players who were responsible for its revenue by implementing programs for their athletes. For example, meditation and empowerment programs that could be made available. The one billion dollar settlement with injured former players is fine, but if not used in a helpful way, it could be a waste. These players will need someone to see them through the real hard times. I believe the role of the NFL could be to offer regular meditation sessions for all the players, so they can have a practice of creating a strong mind especially when they are off the field. It would also be helpful to develop a section in the NFL that will support families and perhaps research that could help to stabilize the damage already done and prevent future irreparable damage to our athletes. I believe Concussion will give us a wake-up call on how we support and reward players who have brought so much joy into our lives. When concussions occur, affected players might not be able to take the ball down the 50 yard line anymore; the ball they will have to take is the ball of life to see this trauma through. Dr. Bennett Omalu simply spoke the truth of his discovery and shared it. Sometimes the truth can set you free, but it depends on who is the holder of that truth. Let's consider the physicians taking care of players who are more than likely receiving high salaries - Concussion may be a catalyst for those doctors to reconsider why they became a physician in the first place - was it for a game or to make lives better? They are on the sidelines to address issues that not only impact the game, but also impact lives. In light of the new research provided by Dr. Omalu, it seems the movie Concussion highlights that all parties involved have a responsibility going forward. · For example, on the part of the NFL, many believe there could be more sensitivity shown to the players, rather than to potential profit and perhaps meditation and empowerment programs could be offered for the players to make them more self-aware of their choices, intentions and feelings. · The physicians examining patients could be more aware of the brain's vulnerability to injury in sports generally and specifically football, given that it is such a high contact sport. · The players themselves could more thoroughly assess the potential for life altering injuries and brain trauma as a possible consequence of the sport. · The spectators who find so much entertainment in this national sport could have more compassion for the health and well being of the athletes who are getting battered and bruised and support the implementation of the new concussion protocols which have been put in place. The film Concussion is not just about the issue of concussions in the NFL, it highlights the daily decisions we each have to make between inaction and action, silence and courage. On December 25th, Christmas Day, this eye opening movie will be released in theaters around the country. Football has the power to unite a nation, and even a world. Let's not turn a blind eye on the players and to the issue of head trauma and concussions. We are at a time of great transformation and we are all in this together.